The notion of “automated marketing” may sound impersonal and disconnected, but it certainly doesn’t have to be. In fact, it shouldn’t be about creating a robotic standardized experience. What automated marketing is really about is cultivating relationships, nurturing leads and being the first choice when they’re ready to buy. It’s a model in which everyone wins. Your company wins more business. And your customers win by receiving a more personalized experience. Marketing often feels impersonal to potential customers because they are getting the same message as everyone else – regardless of their needs. But with automated marketing, you can leverage smart email nurturing to send the right content to potential customers at the right time. So, instead of confronting a cold lead with a sales pitch right off the bat, you can use marketing automation data to figure out what they’re interested in. Then, you can deliver helpful information that addresses that interest, or even solves a problem. As a result, you establish trust, boosting their “brand affinity” for your product. As you continue to nurture potential customers with content that resonates with their needs, they are more likely to engage with you. They’re more likely to open an email from your company and click a link. They’re more likely to pick up the phone when your company calls. When you automate your marketing, more leads convert into customers because they feel they’re receiving helpful, relevant information from a company that understands them, rather than impersonal marketing simply trying to sell them something. When automated marketing is done right, it feels like a “continuous and relevant discussion” with potential clients. Website tracking and email analytics are core features of marketing automation that track your relationship with leads, prospects, and customers. Data like the topic pages a contact has visited, or the email link they’ve clicked indicates where they want the conversation to go next. And, when you pull that helpful data into a CRM where you can add your own notes on each contact record, you have a wealth of information to get every conversation just right. It works whether your marketing assistant is pulling a list of relevant leads to send a special promotion to. And it works when your sales person is making a follow-up call to a potential customer. Your contacts feel like they are being heard during the customer experience because they can see your sales and marketing efforts adapt as their needs and interests evolve. With automated marketing, you can collect, organize, and use data to continue the conversation with your contacts – without losing that human touch. According to research, only about one in four leads “is qualified and ready to buy when marketing first receives them.” Of course you want to be better at identifying and contacting the leads that are practically ready to go and do business with you today. However, while research revealed that 25% of leads are ready to go and another 25% are never going to buy your product, and that still leaves 50% of potential clients who are on the fence. I guess you could just ignore 50% of your leads – but I imagine you probably want to make the most of every lead that you worked hard to acquire. So instead of letting these leads go to competitors – or never make a purchasing decision at all – nurture them. Creating a lead nurturing campaign allows you to stay top of mind with potential customers whenever they think of your kind of product. Building an automated marketing campaign for leads that aren’t ready to buy allows you to further their interest and trust in your business as they move closer and closer to making a purchase decision. It’s hard to get attention these days, and it’s hard to give everyone the personal attention they deserve. Automated marketing is your secret weapon to meet the current needs of potential customers, keep the conversation going, and nurture leads that are on the fence until they’re ready to buy. 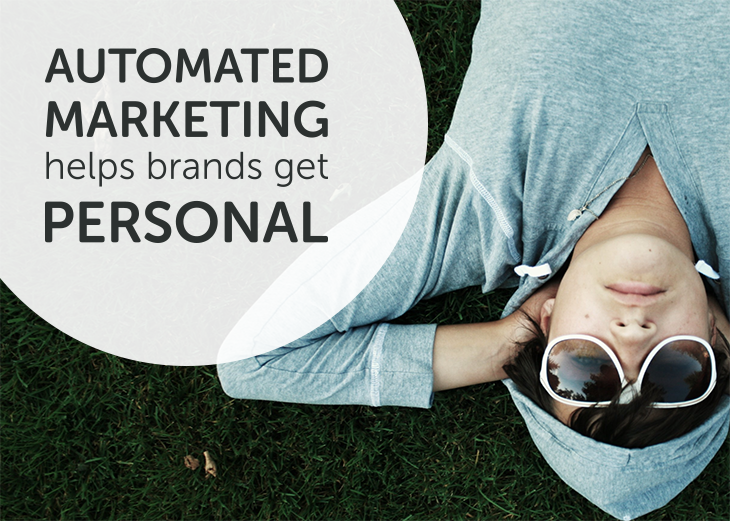 When it comes to providing a personal touch, marketing automation delivers.